It’s possibly NetEnt’s most sacred slot yet. A 5 tier high Pyramid boasting the developers Avalanche technology and inscribed with a whopping 720 pay lines. All containing a Pharoahs Fortune of 3, 600, 000 possible coins. Pyramid: The Quest for Immortality is a unique 5-reel casino game with an Ancient Egyptian theme. As well as big tumbling multipliers and a 500 coin jackpot that puts players in the Valley of the Kings from just 20p per spin. Show me the mummy! Guarded by Ancient Egyptian Gods Anubis and Horus, NetEnt’s latest Pyramid configuration is now one of the slots wonders of the gaming world and quite rightly so. It’s on a desktop or mobile thanks to its mobile slot Touch capability. It uses Avalanche Reels that can multiply winnings by 10 and it also has incredibly flexible on bets. There’s a Wild Generation concept too for increasing the longevity of winning life, perhaps a tribute notion to Immortality itself. 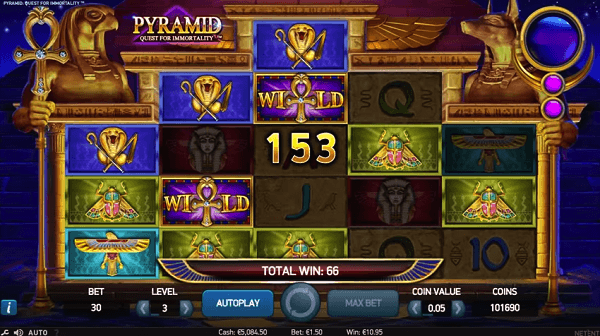 As with other next-generation NetEnt Slots, The Quest for Immortality Slot is visually impressive with strong graphics. The Egyptian Soundtrack is both mysterious and exciting, and in-game depth is deep enough to make playability engaging. It’s 5-reels wide but fairly dynamic thanks to 720 pay lines. There is also plenty of movement on bets with spins in the range of 20p to £200. NetEnt is saying that big winners could live like Pharaohs. Let’s just hope that doesn’t mean mummification and entombment when the money’s gone! It’s hard to fault the visuals on NetEnt’s latest slot so we won’t try. Let’s just say the developers and illustrators work well together, and for that we get graphics, and bold colour scheme that works well. We screen tested Pyramid: Quest for Immortality as a mobile slot first, driving the NetEnt Touch version on iPad, iPhone, and a selection of other well-known smartphones and tablets. In its mobile form, the Touch technology is fast, user-friendly and pixel proud. Showing us just how good NetEnt’s mobile slots are now becoming. It sounds good too. The soundtrack’s not overly repetitive, and the sound effects during gameplay are well timed and effective. The paytable information is easy to find, and the slots bonus features provide sufficient playability value. The Pyramid: Quest for Immortality Online Slot for desktop is equally accomplished and provides a better experience using the bigger. Either way, this is a game worth a spin. Play Pyramid Quest for Immortality Slot for real money and the games symbols naturally become more interesting. Keeping with the obvious Ancient Egypt theme, there’s a backdrop of Giza under the shade of night with God’s Anubis and Horus standing watch. Inside the reels of the NetEnt 720 pay line pyramid, various hieroglyphics, artefacts and other Egyptian treasures lie waiting to produce possible winning combinations. Card values Ace to 10 are the lower payout table values, artefacts and treasure make up the higher payout symbols with the staff and sceptres of Anubis and Horus respectively forming the slots bonus symbols. At the lowest cost per play from just 10p per spin, the price for Immortality is smaller than you think. NetEnt’s marketing team suggest that big winners could live like Pharoahs, and if that’s the case, it will be the features of Pyramid: Quest for Immortality that will bring in the winnings to make such a claim realistic. In-play features for the Pyramid Quest for Immortality Slot consist of a new Wild Generations concept and NetEnt’s powerful Avalanche Multiplier that can reach as much as 10x on payouts. It’s this charming characteristic that could net real money players up to 3, 600, 000 coins, a Pharoahs lifestyle indeed. NetEnt’s Wild Generations technology is triggered using the slots Gold Wild Ankh symbols. If found at the top of either reels 2, 3 and 4 and forming part of a winning combination, that symbol will become a new Wild for the next Avalanche, therefore extending winning possibility into the next spin, hence the next generation of spins. All wins will then successfully unlock an Avalanche of falling rocks and symbols, don’t worry it’s not the gods getting upset. The Avalanche Multiplier increases by 1 with every 3-successive Avalanches that contain at least one winning bet combination. This winning multiplier system is unique to the NetEnt 720 pay line system and can increase to 10x. 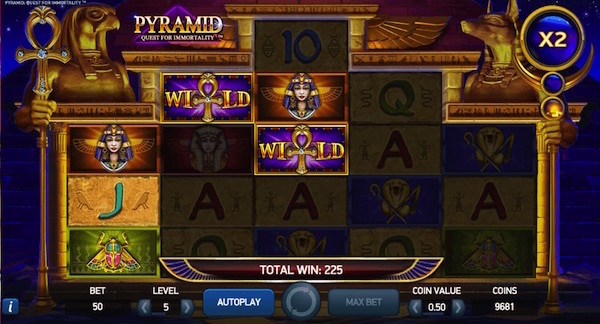 Features are identical on both the Pyramid Quest for Immortality mobile slot (NetEnt Touch) and the desktop online slot. The Quest for Immortality Slot offers real money players flexible betting control with 10-betting levels subject to a coin value range of 0.01 to 2.00, that’s 10p to £200 a spin. The in-play jackpot is 500 coins though bonus games can pay exceptionally more, take NetEnt’s advertised 3, 600, 000 coins using multipliers, etc. The payout rate is 96.48% RTP putting this slot alongside NetEnt’s other recent creations suggesting the developer is striving to make good on its ever improving RTP average. As UK online slots players continue to demand more from their games developers, NetEnt’s latest Egyptian adventure is a sign the developer is listening. By avoiding repetition and trying something new on the slots grid layout, Pyramid Quest for Immortality is an invitation for tomb raiders everywhere looking for something different to plunder those hard earned spins. It looks great with graphics now at their most capable, animated tumbling reels add to the action and 720 pay lines improve the possibility. With mobile slot Touch format and desktop casino both ready to go, your gamble on the afterlife is all that remains.